Click here to find a radiator for your vehicle. One of the key systems on your vehicle is the cooling system. All engines, whether they are the mundane point A to B type engines or high performance engines designed for maximum power, produce a significant amount of heat. The cooling system is a direct partner with the engine that allows it to work at its maximum potential by dissipating this heat that would otherwise damage the engine. Perhaps the part that does the most work within the cooling system is the radiator, which uses air to cool your car’s coolant. 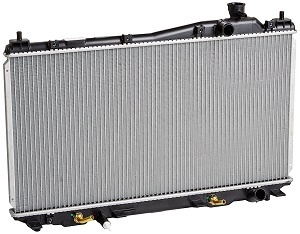 The cooling system radiator is a large heat exchanger that in most vehicles is positioned directly at the front of the vehicle. It is usually directly behind the vehicle front bumper and grille which places it perfectly for exposure to maximum airflow as the car moves forward. When not in motion, a mechanical or electric fan draws air through the radiator to keep the car cool at idle. As the engine produces heat, the coolant that constantly circulates through the engine (thanks to the waterpump) is heated and then pumped from the engine through the radiator. Air flowing past the channels in the radiator core draws heat from the hot coolant. Once cooled, the coolant is then returned to the engine to carry more heat away from the engine and back through the radiator. This process happens continuously anytime your engine is running. The radiator is a simple component that has two primary failure modes: a leak or a clog. A leaking radiator – This failure mode is the easiest to detect as you will most likely notice a small pool of coolant in the engine bay of your vehicle or on the ground directly under (or very nearby) the radiator’s location. If you see coolant on the ground, you will have to investigate to verify where the leak originates from. It is usually easy to identify when it comes from the radiator. Another telltale sign of a coolant leak in absence of visible coolant on the ground is that you may sometimes detect a sweet smell from the coolant if it has anti-freeze as part of the mixture. Finally, you may just notice that your coolant is low which can signal that you should inspect for a leak. A clogged radiator – This condition will occur to varying degrees from a small partial clog to a full clog that simply blocks all coolant flow through the radiator. The biggest indicator that you will probably notice is that your engine appears to be running hotter than normal. A reduction in coolant flow through the radiator will reduce the cooling system’s ability to get rid of the engine heat and will return warmer coolant to the engine. That cycle of warmer and warmer coolant being returned will eventually cause an overheating condition that may force the radiator to push coolant through the seal at the radiator cap and into the overflow bottle if your vehicle has one installed. A clogged radiator is significantly less common than a leaky radiator. One of the most common causes of clogged radiators is inappropriate use of stop leak sealants, so if you recently used some and have cooling issues, a clogged radiator is a likely culprit. We should take a quick moment to note that beyond the radiator, there are other components in the cooling system that can have similar symptoms to a bad radiator. You want to rule these out before buying a new radiator as otherwise you may be spending money on a new radiator when you don’t have to. If you find a small amount of coolant on the ground, double check that the hoses or other cooling components aren’t slowly allowing coolant to leak. Also be sure to inspect the thermostat, which slows coolant flow until the engine is warm before opening and allowing maximum flow. If it does not open correctly it may cause overheating or temperature fluctuations similar to a partial clog in the system. A cooling system pressure tester is a great tool that can help find the source of a leak if the leak is very small. Once you have determined that the radiator is in fact leaking or clogged, replacement is relatively simple. Step 1 – First thing to ensure is that the coolant is cold. Never open a hot radiator, and don’t work on a vehicle with hot coolant or you risk getting burned. Step 2 – On all vehicles, there will be coolant that needs to be drained from the radiator before ithe radiator can be removed from the vehicle. Check to see if your radiator has a drain at the bottom. This will most likely be in the form of a fastener or a petcock drain. If none are present, this can also be accomplished by removing the clamp on the lower radiator hose and popping the hose off. Before you drain the coolant, make sure to remove the radiator cap or the cap of the expansion tank if so equipped. This will allow ambient air to enter the radiator and help coolant drain easily from the radiator with minimal splashing into the drain pan. Typically the drain can be opened using a combination wrench or a ratchet with a deep socket. Step 3 – Once all the coolant has drained from the radiator, also check for any additional lines that run to the radiator. There may be a transmission cooler integrated into the radiator, so those lines will also need to be disconnected if this is the case. Step 4 – Next you will want to disconnect the main radiator hoses and any overflow hoses that run to/from the radiator. They will be held on by hose clamps (pinching clamps that require pliers to squeeze and remove or worm-gear clamps that require a screwdriver to remove). Remove all clamps and coolant lines from the radiator. Step 5 – The last step for removal will be to loosen the fasteners and brackets that hold the radiator in the vehicle using tools from your mechanic’s tool set (socket set). Once they are removed, the radiator can be lifted out of the engine bay and removed from the vehicle. Step 6 – Replacement of the new radiator should be a reverse of the removal steps. If there are any caps over the fluid connection points on the new radiator, leave them on until you need to make the connection. Removing them prior to that point may allow contaminants into the radiator and cause clogging issues later on. Once the radiator is mounted back in your vehicle, be sure to add coolant to the cooling system via the radiator or expansion tank until it is full. Step 7 – At this point you will want to run the vehicle in order to circulate the coolant. Ensure that your heater controls are on hot to allow coolant to flow into the heater core and push all air out of the cooling system. Depending on the make and model of your vehicle, you may need to open a bleed screw to allow the air bubbles to escape. Once the coolant has cycled for a few minutes, and you are confident there are no air pockets in your coolant system, you can then turn the engine off. Be sure to watch your coolant level and engine temperature during this time, adding more coolant as necessary (and remember to take necessary safety precautions since your coolant is now hot!) until your system is full and operating properly. Spectra has long been known to make a large variety of automotive parts. They make everything from fuel system components to ignition components to cooling system components. They are well regarded and provide both aftermarket and OEM parts for most vehicles. Overall, they make high quality parts and have a good reputation. Their radiators live up to these expectations, and as such we think they make a great choice when searching for a replacement radiator that is both long lasting and reasonably priced relative to the competition. Click here to find a Spectra radiator for your vehicle. Koyo, aka Koyorad, specializes in aftermarket radiators and cooling system components. Started in Japan over 60 years ago, Koyo now serves the entire world when it comes to providing replacement radiators. The US headquarters is based in Irvine, California and they distribute across the US for all vehicle models they support. They are known for their excellent fit and quality which means they are a good choice when choosing between replacement radiator brands. For this reason, we highly recommend checking them out. Click here to find a Koyo radiator for your vehicle. Behr has long been known for making radiators. They are often found in a variety of vehicles right from the factory. This is particularly true for German vehicles, such as many of the offerings from BMW and Mercedes. In addition to making radiators, Behr makes oil coolers, AC condensers, and a range of other automotive cooling parts. Overall, their quality is great. In addition to making high quality radiators, their components are typically very fairly priced so they always make for an affordable option. Click here to find a Behr radiator for your vehicle. Nissens is a global company that dabbles in a whole bunch of industries from defense to renewable energy. Their automotive branch is one of their key business lines where they are most well known for making radiators. In addition, Nissens also makes oil coolers, intercoolers, fan clutches, and other types of heat exchangers for cars. Like the previously mentioned brands, Nissens makes parts that are both high quality and easy on the wallet. Click here to find a Nissens radiator for your vehicle.